Experts confirm they belong to the Byzantine period. In a modern society, people tend to assume that all traces of the past have already been tucked away in museums. 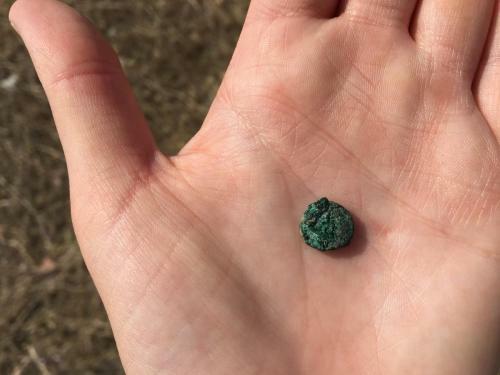 But when 41 Walla Walla University students roamed the Middle East during the Bible Lands Study Tour this past summer, two participants uncovered a piece of history. 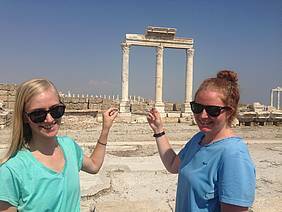 Toward the end of the group’s nearly-four-week trip, Sara Bumgardner and Sarah Thompson, two fourth-year students attending the Seventh-day Adventist school in Walla Walla, Washington State, United States, came across an exciting discovery—They found two 5th-century coins in the ruins of the ancient town of Laodicea, part of present-day Turkey. Bumgardner, a sociology major, made the first discovery while examining a piece of pottery on the ground. 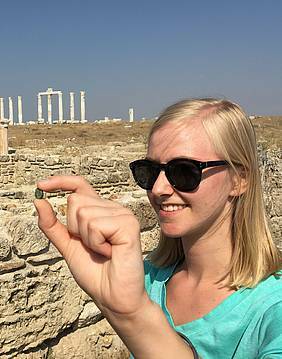 “After I found the coin, I think a number of us spent more time looking down at the ground than up at the excavated ruins of Laodicea,” Bumgardner said. And that’s when Thompson, a health science major, spotted a second coin. “I saw a very small but very round object, and I picked it up,” she said. “It just looked like a round gray pebble.” The tour guide confirmed that both were authentic Byzantine coins. The Bible Lands Study Tour occurs every two years and provides participants with eight religion credits. The school encourages students interested in history, travel, or religion to register.